Typically I wait until December to decorate for Christmas but this year I decided to start early (like before Thanksgiving early!). I have been pleasantly surprised by how much cheer it has brought to our home. 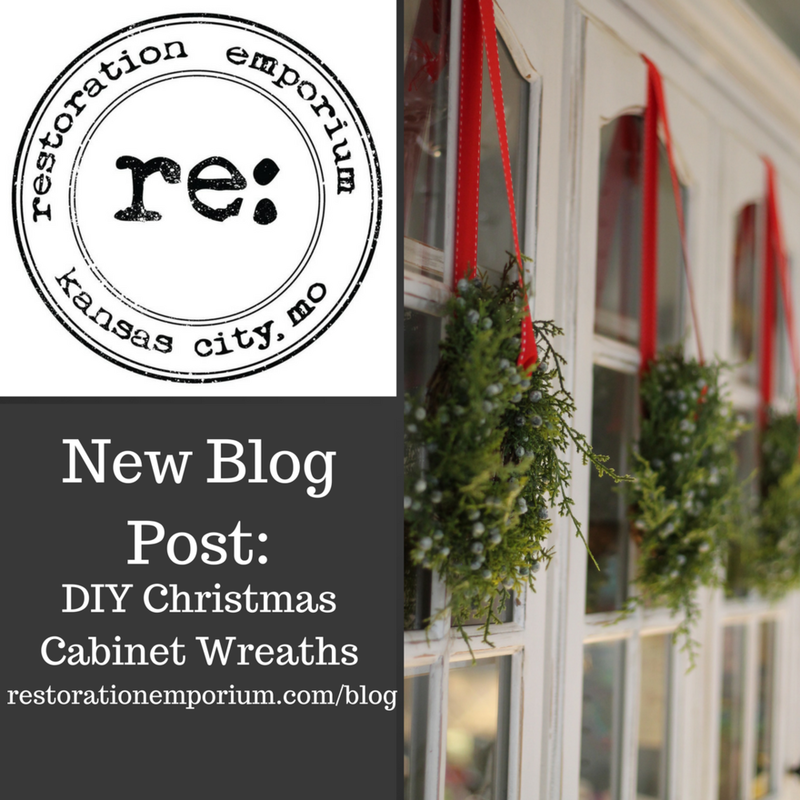 Today I am sharing about my DIY cabinet wreaths! I found this inspiration on Pinterest (of course, where else would a mama on maternity leave spend her days??) and I am SO excited to share it because it was SO easy and budget friendly. 1 roll of ribbon from Hobby Lobby – I picked a simple red because I knew I would have other patterns and things to add texture to my décor. Depending on your kitchen design scheme, you could do a fun buffalo check, chevron, or hounds tooth pattern to add dimension and fun. 1 package of small 3M hooks – seriously, these bad boys are my LIFE. 3M hooks allow me to hang stuff wherever and I don’t have to put holes in the walls (or ask my hubby to get out the drill)! Plus, since my daytime gig is in the classroom, you can imagine, these little guys are ALL over my classroom. 4 small wreaths from Restoration Emporium – now here is where you could go more extravagant or keep it simple. The wreaths I chose for my cabinets are a little step up from just the plain evergreen stuff you might see at the big stores right now. I wanted ours to keep in line with our farmhouse feel, and I wanted them to look a little more real. I love the detail on them and I just love how they add some green in our white kitchen! You can find these wreaths and a variety of others in one of our three locations (West Bottoms, Park Place, or the Country Club Plaza). 1. Measure the ribbon – so...I am not really a “get-out-a-tape-measure-and-measure-it” kind of gal, I usually just jump right in, so that’s what I did! I pulled the ribbon off the roll and looped it through the wreath, then I stuck it up on the cabinet and eyeballed it about where I wanted it. THEN I cut. Don’t go crazy and cut before you measure because you’ll end up using too much ribbon and wasting some of it. 2. Place the hook – I then took one of the small hooks and placed it (upside down) in the center of the cabinet about 1/3 of the way down on the backside. 3. Attach the ribbon – With the ribbon looped through the wreath, attach it to the hook. There is a few ways to do this but I just snipped a small slit in mine since my hooks were too small to tie a bow around and I didn’t want the ribbon showing through the glass of my cabinets. It really was just that simple! I hope that you get some DIY inspiration today and will get to try this too! I look forward to seeing you at one of our three locations this weekend for small business Saturday!